Surface of a distant moon, or a common food item? You be the judge! 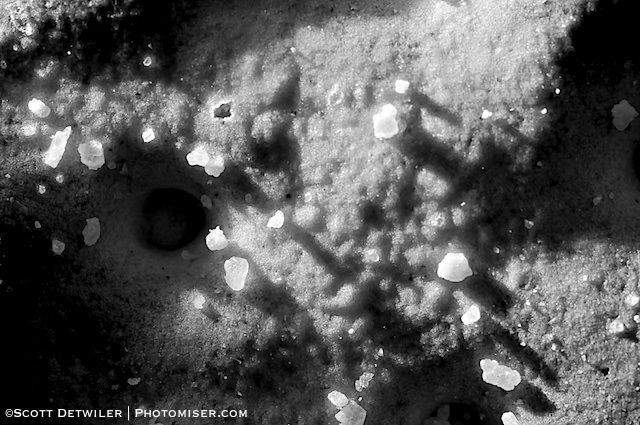 A bellows and some side-lighting makes the cracker surface look like an alien landscape strewn with crystal boulders. I am enjoying the side lighting technique here. The standard macro technique is full-frontal lighting. I don’t have a ring flash, so full-frontal lighting is trickier than side-lighting right now with my bellows set-up. Necessity is the mother of invention. We were experimenting more with the Nikon PB-6 bellows today, which we got out yesterday. We backed off the magnification a bit. I was looking for an object that would be interesting up close. A saltine soda cracker has interesting relief this close, it turns out. I lit the subject obliquely with an LED flashlight. I like how it makes the salt grains pop out. For this first photograph, we are using a 50mm EL-Nikkor f/2.8 enlarger lens on the bellows, set at f/16 for maximum depth of field. The color is a result of playing with the saturation and the blue curve. It’s a little soft, I think, which is more apparent in the full-sized image. (Shrinking things down for blog posting tends to paper over certain issues!) It may be because this EL-Nikkor lens came to me quite dusty. I’ve disassembled it to clean it, but it is hard to get these things back together perfectly clean without a clean-room. It may be my photography technique, for that matter. The depth of field is so shallow at this extreme macro distance, too, which may make “taller” objects look soft. By the way, that’s 1600 ISO on the Nikon D90, which I think looks pretty good at this size. This second image is with a 75mm f/4 EL-Nikkor-N, a more recent version of EL-Nikkor. EL-Nikkors have some of Nikon’s best glass. But, they are largely obsolete and thus inexpensive. This lens arrived with some dust as well, and I have cleaned it up. Though it did not arrive as dusty as the 50mm, it also seems to have a be a little soft, either from the lens or my technique. I keep this lens set at f/8, for use in another project. This time I lowered the ISO to 200, and post-processed to black and white. I used the “black and white – blue filter” Aperture preset that comes preinstalled with Aperture, with some extra tweaking for contrast. By the way, this bellows is not on my list of Best Cheap Nikon Accessories, because, frankly, it’s kind of expensive. Very bulky and delicate, too, especially in the field. I find that the Micro-Nikkor 60mm f/2.8 AF works well for most macro photography, plus it meters through the lens. Bellows have to be used in manual mode. If you want move beyond the a micro-nikkor, a set of extension tubes, such as these from Fotodiox will add to your magnification very cheaply. The advantage of the bellows is a continuous range of magnification, plus the rails for precise focus. This entry was posted in Black and White, Macro Photography, Photomiser Gallery and tagged Bellows, Flashlight, Macrophotography, Nikon D90.